BRCA1 and BRCA2 are human genes that produce tumor suppressor proteins. These proteins helps in repairing damaged DNA and, therefore, plays a crucial role in ensuring the stability of the cell’s genetic material. When either of these genes is mutated, or altered, such that its protein product is not made or does not function correctly, DNA damage may not be repaired properly. As a result, cells are more likely to develop additional genetic alterations that can lead to cancer or related tumors growth. It is well known that these BRCA mutations are responsible for the majority of hereditary breast and ovarian cancers. The exclusive rights for BRCA1/2 testing has been overturned and now testing can be offered to all for a realistic price. To confirm the presence of the BRCA1 and BRCA2 gene mutations, our genetic Laboratory offers a DNA based test procedure, so that right step can be taken on right time. Having a BRCA gene mutation is uncommon. Inherited BRCA gene mutations are responsible for about 5 percent of breast cancers and about 10 to 15 percent of ovarian cancers. There would be 87% risk among people with a mutation in either the BRCA1 or BRCA2 gene for developing breast cancer and up to 44% for developing ovarian cancer by the age of 70. The BRCA gene test is offered only to people who are likely to have an inherited mutation, based on personal or family history, or who have specific types of breast cancer. The BRCA gene test isn’t routinely performed on women who are at average risk of breast and ovarian cancers. A harmful BRCA1 or BRCA2 mutation can be inherited from a person’s mother or father. Each child of a parent who carries a mutation in one of these genes has a 50 percent chance of inheriting the mutation. 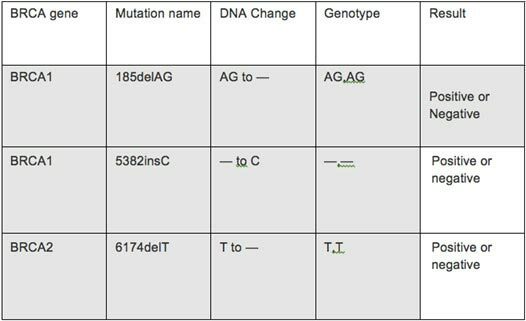 The effects of mutations in BRCA1 and BRCA2 are seen even when a person’s second copy of the gene is normal. BRCA1/2 testing requires a simple procedure based on buccal cheek swab. Once the samples are collected, these are sent to our laboratory for a clinical precise analysis of the BRCA1 and BRCA2 mutations. Realizing the importance of these tests, we make no hustle in providing results and thus offer 1 week turnaround (with additional charges) time. Knowing that the early results may help you and your healthcare provider act before cancer has a chance to develop, we ensure that the committed timeline is fulfilled always.